"Regional Airlines" redirects here. For the former French airline, see Regional Airlines (France). As an affiliated airline, contracting with a major airline, operating under their brand name, and filling two roles: delivering passengers to the major airline's hubs from surrounding towns, and increasing frequency of service on mainline routes during times when demand does not warrant use of large aircraft, known as commuter flights. Operating as an independent airline under their own brand, mostly providing service to small and isolated towns, for whom the airline is the only reasonable link to a larger town. Examples of this are PenAir, which links the remote Aleutian Islands to Anchorage, Alaska, and Mokulele Airlines, which operates in the Hawaiian islands. Small regional airlines operating in the U.S. during the 1960s and 1970s were also known as commuter airlines and were classified as such in the Official Airline Guide (OAG). Regional airlines began by operating propeller-driven aircraft over short routes, sometimes on flights of less than 100 miles. In the early days of commercial aviation few aircraft had ranges greater than this, and airlines were often formed to serve the area in which they formed. That is, there was no strong distinction between a regional airline and any other airline. This changed with the introduction of long-range aircraft, which led to the development of the flag carrier airlines, such as British Overseas Airways Corporation and Trans-Canada Airlines. As the flag carriers grew in importance with increasing long-range passenger traffic, the smaller airlines found a niche flying passengers over short routes to the flag carrier's airport. This arrangement was eventually formalized, forming the regional airlines. Through the 1960s and 1970s, war surplus designs, notably the DC-3, were replaced by much more capable turboprop or jet-powered designs like the Fokker F27 Friendship or BAC One-Eleven. This extended the range of the regionals dramatically, causing a wave of consolidations between the now overlapping airlines. In the United States, regional airlines were an important building block of today's passenger air system. The U.S. Government encouraged the forming of regional airlines to provide services from smaller communities to larger towns, where air passengers could connect to a larger network. None of these airlines survive today; some airlines use these names today but are not the direct successors to the original airlines. A history and study of regional airlines was published by the Smithsonian Institution Press in 1994 under the title Commuter Airlines of the United States, by R.E.G. Davies and I. E. Quastler. One of the first independently owned and managed airlines in the world that rebranded its aircraft to match a larger airline's brand was Air Alpes of France. During 1974, Air Alpes painted its newly delivered short range regional jets in the livery of Air France. 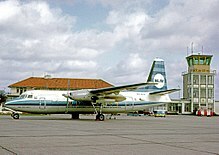 NLM Fokker F.27 Friendship wearing the basic mainline livery of KLM Airlines however wearing the initial titles of NLM at Groningen in 1967. NLM was set up as a KLM subsidiary from its founding and later evolved into KLM Cityhopper. In 1976 Cabin Staff contractually won opportunity to be considered for KLM employment after a set period of commitment to NLM. An Aerospatiale Corvette of Air Alsace at Brussels Airport in 1977. Much like Air Alpes, these aircraft fed regional and higher yielding traffic to Air France and were also one of the first companies to adopt the now common practice of taking on the branding livery of a much large company, namely Air France; who they operated in association with. NLM's KLM style branding does however pre-date the Air France efforts though by a number of years. The success of the "rebranding" or "pseudo branding" of a much smaller airline into the name recognition of a much larger one soon became clear as passenger numbers soared at Air Alpes, and it was soon decided to paint other aircraft such as the Fokker F-27 into full Air France colours as well. Since the Airline Deregulation Act of 1978, the US federal government has continued support of the regional airline sector to ensure many of the smaller and more isolated rural communities remain connected to air services. This is encouraged with the Essential Air Service program that subsidizes airline service to smaller U.S. communities and suburban centers, aiming to maintain year-round service. Although regional airlines in the United States are often viewed as small, not particularly lucrative "no name" subsidiaries of the mainline airlines, in terms of revenue, many would be designated major airline carrier status based on the only actual definition of "major airline," in the United States, the definition from the U.S. Department of Transportation. This definition is based solely on annual revenue and not on any other criterion such as average aircraft seating capacity, pilot pay, or number of aircraft in the fleet. It is common in the U.S. to incorrectly associate aircraft size with the Department of Transportation's designation of major, national, and regional airline. The only corollary is the Regional Airline Association, an industry trade group, defines "regional airlines" generally as "...operat(ing) short and medium haul scheduled airline service connecting smaller communities with larger cities and connecting hubs. The airlines' fleet primarily consists of 19 to 68 seat turboprops and 30 to 100 seat regional jets." To be clear there is no distinction in the Department of Transportation definition of major, national and regional airlines by aircraft size. The definition is based on revenue. The clash of definitions has led to confusion in the media and the public. Beginning around 1985, a number of trends have become apparent. Regional aircraft are getting larger, faster, and are flying longer ranges. Additionally, the vast majority of regionals within the United States with more than ten aircraft within their fleet, have lost their individual identities and now serve only as feeders, to Alaska Airlines, American Airlines, Delta Air Lines, or United Airlines major hubs. Regional aircraft in the US have been getting slightly more comfortable with the addition of better ergonomically designed aircraft cabins, and the addition of varying travel classes aboard these aircraft. From small, less than 50-seat "single-class cabin" turboprop, to turbofan regional jet equipment, present day regional airlines provide aircraft such as the higher capacity CRJ700, CRJ900, CRJ1000 series of aircraft and the somewhat larger fuselage Embraer E-Jets. Some of these newer aircraft are capable of flying longer distances with comfort levels that rival and surpass the regional airline equipment of the past. In the early 1990s, much more advanced turboprop-powered, fuel efficient, and passenger friendly DC-3 type replacement projects such as the 19 passenger Embraer/FMA CBA 123 Vector and the 34 seat Dornier 328 were undertaken, but met little financial success, partly due to economic downturn in the airline industry resulting from the outbreak of hostilities when Iraq invaded Kuwait. Many of the regional airlines operating turboprop equipment such as Delta's regional sister Comair airlines in the United States set the course for bypassing entirely the regional turboprops as they became the first to transition to an all-jet regional jet fleet. To a lesser extent in Europe and the United Kingdom this transition, to notably the Embraer or Canadair designs, was well advanced by the late 1990s. This evolution towards jet equipment, brought the independent regional airlines into direct competition with the major airlines, forcing additional consolidation. To improve on their market penetration, larger airline holding companies rely on operators of smaller aircraft to provide service or added frequency service to some airports. Such airlines, often operating in code-share arrangements with mainline airlines, often completely repaint  their aircraft fleet in the mainline airline's sub-brand livery. For example, United Express regional airline partner CommutAir branded its entire fleet as United Express. On the other hand, regional airline Gulfstream International Airlines does not brand their aircraft. When Colgan Air was still operating, they branded a handful of aircraft as Colgan Air, but most were branded as Continental Connection, US Airways Express or United Express, with whom it had contractual agreements. Typical seat map of a smaller regional airliner as is often flown by the regional airlines. The smallest aircraft flown under such brands and regional airlines may or may not have lavatories. Many airline passengers find sub-branding very confusing, while many other airline passengers are content to think they are on a mainline or flagship airline's aircraft, while in actuality they are far from it. Sub-branding is pretty consistent throughout the airline industry of the United States, with all the regional airlines, mainline airlines, and the regional airline holding companies, as well as the mainline airlines holding companies participating. Post airline deregulation, airlines sought added market share and to do this they sought partnerships with regional and small airlines to feed traffic into the airline hub. Initially these tie ups tended to use small 15 -19 seat aircraft, which did not have a reputation of passenger comfort, or safe reliable operations, by small often under capitalized tiny airline operators. To create a common tie and what appeared to be seamless to the air traveler, major carriers marketed in advertising and soon had much smaller airlines paint their small and what was often described as puddle-jumper aircraft, in the image and branding colors of the much larger mainline partner. This was to give the appearance of reliability. Over time these regional aircraft grew in size as airline hubs expanded and competition dwindled among the major carriers. Below is a list of many of the regional brands that evolved when regional airlines were advertised to look like the major airlines. In North America many of the largest regional airlines have joined the lobbying group Regional Airline Association. This association lobbies purely for the financial interest of the corporate bodies it constitutes, not the employees of those airlines. Many large airlines, especially in North America, have established operational relationships with one or more regional airline companies. Their aircraft often use the aircraft livery for the company they are operating flights for. These airlines can be subsidiaries of the major airline or fly under a code sharing agreement or operating through capacity purchase agreements, with the mainline parent company financing the aircraft for the regional airline, and then placing the aircraft with the regional for very little cost. An example would be Envoy Air, which is fully owned by American Airlines Group and does business as American Eagle. For all practical purposes, regional airlines in the United States today, are nothing more than co-branded feeder airlines to U.S. airline alliance largest airports and major jet airlines chief focus cities / airline hubs; possessing very few independent routes truly operated independently and apart from those described. The trend of branding smaller and mostly regional (in terms of geographical scope) airlines to match the mainline airlines, has led to only three main sub-brands in the United States. These three, American Eagle, Delta Connection, and United Express are the post-deregulation survivors resultant of the multiple bankruptcies and mergers of the major, legacy, mainline airlines, as well as some discount or low-cost carriers which adopted similar strategic marketing ideas. Many small regional airlines have grown substantially, usually through virtual mergers by use of the regional airline holding company, as pioneered by AMR Corporation in 1982. AMR created the AMR Eagle Holding Corporation which unified its wholly owned American Eagle Airlines and Executive Airlines under one division, but still maintained the regional airlines' operating certificates and personnel separate from each other and American Airlines. These virtual airlines, as they have been called, tend to use largely outsourced labor at most stations, to reduce costs. In 2011, 61% of all advertised flights for American, Delta, United and US Airways were operated by their regional brands. This figure was only 40% in 2000. 1967 – CAB makes exemption for airlines, starting with the local service carrier Allegheny Airlines; to suspend operating a route with large aircraft due to a lack of passenger traffic to do so profitably, provided the airline operating the CAB awarded route substitutes its operation with other equipment and maintains responsibility the route is served. As such this "exemption" allowed the development of the Allegheny Commuter System and the subcontracting of Henson Airlines to fulfill Allegheny's CAB route award obligations. 1969 and before – aircraft falling below the weight of 12,500 lbs were considered small aircraft and thus, not subject to the certification requirements of the CAB. 1972 – relaxations of the CAB regulations permitted commuter aircraft to carry 30 passengers and a payload of 7,500 pounds. 1978 – during the sunset of the CAB regulation the size of commuters were permitted to grow to 60 passengers and 18,000 pounds of freight. 1981 – the United States governmental lobbying body of this industry, known as the Commuter Airline Association, changes its name to the Regional Airline Association. Nantucket Airlines, a brand operated by regional airline Cape Air which is wholly owned by the regional airline holding company Hyannis Air Service. Ravn Connect, a commuter /air taxi brand operated by the regional airlines owned by the HoTH parent company in association with Corvus Airlines which operates under the Ravn Alaska marketing brand and is also owned by HoTH. CityJet is a European regional airline operating services on behalf of Air France. This is a British Aerospace 146-200. European regional airlines serve the intra-continental sector in Europe. They connect cities to major airports and to other cities, avoiding the need for passengers to make transfers. For example, BA CityFlyer a regional subsidiary of British Airways uses the basic Chatham Dockyard Union Flag livery of its parent company and flies between domestic and European cities. In a slightly different category ExpressJet Airlines another regional carrier, but one which is independently owned and managed, although its 205 aircraft fleet operates in the marketing brand of Continental Airlines, Inc., Continental Express. In these roles, all of the preceding airlines are operated primarily to bring passengers to the major hubs, where they will connect for longer distance flights on the national airlines also known as flagship carriers's, larger aircraft. The smallest regional carriers have become known as feeder airlines. The separate corporate structure allows the company to operate under different pay schedules, typically paying much less than their mainline owners. Some of Europe's regional airlines are subsidiaries of national air carriers, though there remains a strong entrepreneurial sector of independents. They are based on business models ranging from the traditional full service airline to low cost carriers. Innovations include one where the passenger is required to join a membership club before being allowed to fly. India has many regional carriers operating currently. Some of these operate under the government's UDAN (Regional Connectivity Scheme). Alliance Air, a subsidiary of India's state-owned flag carrier, Air India. SilkAir is the regional wing of Singapore Airlines and operates scheduled passenger services from Singapore to 37 cities in the region of Southeast Asia, South Asia and China. This airline differs from airlines in North America and Middle America in that it uses "mainline sized equipment" that is aircraft with a seating capacity greater than 99 passengers, but uniquely receives the designation of a "regional airline" subsidiary by its aforementioned airline parent company. Regional Express Airlines (Rex), the largest regional airline outside of the Qantas group in Australia, servicing routes in several states and territories. First year regional pilot pay as of Aug. 2011. Source: AirlinePilotCentral.com, an industry career site. In the film, Capitalism: A Love Story, director and film producer Michael Moore profiled how little most regional pilots are paid in the first few years of their careers. Hourly wages for regional pilots start at $12.50. In comparison, a cabbie in New York averages $17 an hour, according to the city's Taxi & Limousine Commission. On Feb 12th, 2010, a year after the crash of Colgan flight 3407, Frontline premiered its WGA Award-winning exposé on the industry entitled "Flying Cheap". In the program, reporter Miles O'Brien questioned how the impact of low salaries are having on pilot psyches and how safe this could be for the flying public. When asked to respond to the question, Roger Cohen, president of the Regional Airline Association, told Frontline that, "...there are many other people who earn less money than that and work more days in these communities that can afford it and do it and do it responsibly." An alternative to some regional airline service may be the new Small Aircraft Transportation System initiative in conjunction with general aviation and VLJs (very light jets). With the introduction of air taxi VLJs, city pair links to smaller communities lacking regional connections could become more common. In many regions, regional airlines increasingly face competition from high-speed rail with airlines sometimes replacing feeder services through air rail alliances. ^ "Essential Air Service". U.S. Department of Transportation. Office of Aviation Policy. DOT. Tuesday, April 29, 2014. Retrieved Thursday, July 24, 2014. ^ "Frontline: Flying Cheap". Public Broadcasting Service. Feb 9, 2010. Retrieved 1 June 2012. ^ "Members in the Regional Airline Assoc". RAA. Archived from the original on 10 May 2012. Retrieved 28 May 2012. ^ "AMR Eagle Holding Corporation". Retrieved 2007-10-01. ^ "Low Pay One of Many Difficulties Facing Regional Pilots: Fox News". 2011-11-30. ^ "RAA.com, Staff". Archived from the original on 2012-03-02. ^ "Frontline: Flying Cheap, Cohen interview". ^ "SATS & NCAM members continues to develop at Oshkosh AirVenture 2007". Archived from the original on 2007-10-11. Retrieved 2007-10-01. Frontline – Flying Cheap – February 9, 2010. One year after the deadly crash of Continental 3407, FRONTLINE investigate the safety issues associated with regional airlines. This page was last edited on 14 April 2019, at 04:04 (UTC).